KAZAN, Russia (AP) Only five countries have won the World Cup more than once. None of them have a chance to win another this year. 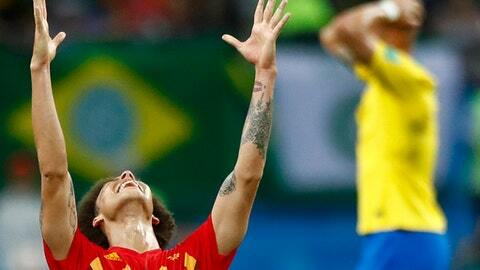 Five-time champion Brazil and two-time champion Uruguay were both eliminated Friday, losing in the quarterfinals. Argentina, another two-time winner, lost in the round of 16 while four-time champion Germany couldn’t make it out of the group stage. Italy, which also has won four titles, didn’t even qualify, losing to Sweden in the playoffs. This is the first time there will be a semifinals without at least one of Argentina, Brazil, Germany or Italy. That only leaves France and England as former champions still with a chance to win another title in Russia. Brazil was one of the biggest favorites heading into the tournament in Russia, but it struggled early in the group stage and finally lost to Belgium 2-1 on Friday in Kazan. After a lackluster start in qualifying, Brazil replaced 1994 World Cup-winning captain Dunga with Tite as coach. Tite oversaw an immediate improvement in results that led to Brazil’s qualification. Although Brazil finished first in Group E, it failed to impress in attack. There were glimpses of pace and skill from Neymar and Philippe Coutinho, but the team was not as free-flowing going forward as many had hoped. At least the defense was solid, conceding only one goal through the round of 16. Brazil has now been eliminated by European opposition in the knockout stages at each of the four World Cups since it last won in 2002. Uruguay was the World Cup’s first winner back in 1930 and the country added a second title 20 years later when it defeated Brazil in the final match in Rio de Janeiro. Although the Uruguayans haven’t made a final since, they have become a presence again in the final stages. In 2010, Uruguay made the semifinals, losing to the Netherlands 3-2. The team came close again this year, but lost to France 2-0 on Friday in Nizhny Novgorod. Uruguay came second in South American qualifying behind Brazil. Its strong all-around performances in Russia, particularly in the 2-1 victory over Portugal in the round of 16, raised hopes that the team could at least match its performance from 2010. However, during the loss to France in the quarterfinals, Uruguay was forced to play without injured striker Edinson Cavani. And a bad mistake from goalkeeper Fernando Muslera gifted Antoine Griezmann a goal. Argentina, the World Cup champion in 1978 and 1986, has arguably the best player of his generation in Lionel Messi. But few gave the team much of a chance of making a second straight final. Qualifying for the tournament in Russia proved to be an ordeal, requiring a final day hat trick from Messi. With coach Jorge Sampaoli struggling to build a team around Messi, Argentina labored during the group stage in Russia, notably in its opening 1-1 draw against Iceland. A 3-0 loss to Croatia raised the prospect that it wouldn’t even make it out of the group, but the team scraped through with a late winner against Nigeria. The reward, though, was tough – France in the round of 16. Kylian Mbappe exploited the lack of speed in Argentina’s defense and lead France to a 4-3 victory. Germany won its fourth World Cup in Brazil four years ago. A chance for a fifth was expected in Russia, not least because the team hadn’t done much wrong in between. Germany’s failure to make the second stage for the first time since 1938 is one of the World Cup’s great surprises. After all, Germany has made it to the semifinals in each major tournament it has contested since 2006. Losing its opening group match against Mexico was seen as a blip. Normal service would surely resume, it was thought. However, the team struggled in its second match against Sweden, requiring a curling goal from Toni Kroos with virtually the last kick of the match to win 2-1. In its final match against South Korea, the Germans lost 2-0. At least the others qualified for this year’s World Cup. Italy, however, didn’t even make it to Russia after losing to Sweden in the playoffs. It’s the first time Italy has missed out on a World Cup in 60 years. Italy’s national team has been in decline since winning its fourth World Cup title in 2006. At the World Cups of 2010 and 2014, the Italians failed to get out of their group.